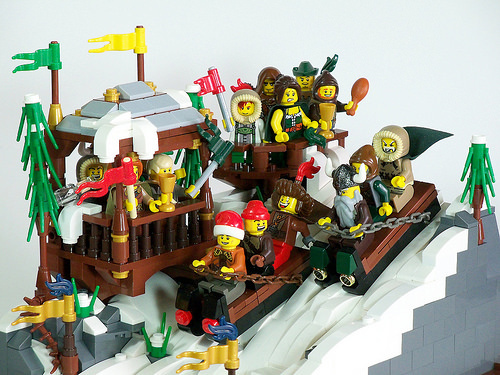 This winter scene, by mrcp6d is a ton of fun. To begin with, the landscaping and snowbanks are perfect. That isn’t easy to do and it gives this model a great foundation. But it is the posing of the minifigs that really sells this build. The grim vikings as they lose, the celebrating of the winners and their fans and the total dejection of the bare-armed woman (isn’t she cold?) as she watches her team come in last really make this scene come alive. It’s too bad bobsledding wasn’t invented until the 1870s because it would have been a great medieval sport!